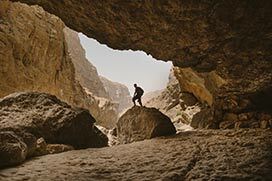 With such a variety of landscapes, Oman provides the perfect opportunity to experience an adventure holiday like no other or sample a day or two of high octane moments as part of an otherwise slower paced trip. 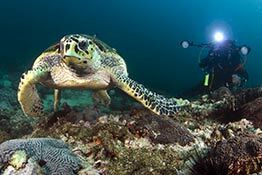 Snorkelling the deep blues off of the thousands of kilometres of coastline, camping under the stars in the vast deserts and exploring the mountains that rise over 3,000m into the sky; adventure is at the heart of every journey through Oman. Less than two hours from the Omani capital of Muscat, the Jebel Akhdar Mountains rise into the clouds, providing an abundance of adventure activities. Hiking, mountain biking and rock climbing can all be done in the presence of stunning views of the surroundings. For those brave enough, the Via Ferrata is sure to get the pulse raising, as travellers zip from rock to rock along secure steel cables (picture below). 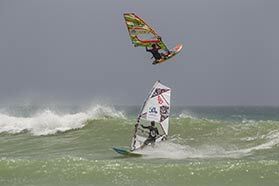 With over 3,000km of coastline, Oman is the ideal place for adventurers to experience adventure amongst the waves. Whether it be sailing, diving, kiteboarding, kayaking, windsurfing, paddle boarding or snorkelling, there is opportunity to find waters as energetic or as calm as is needed. ‘Activity with others’ also takes on multiple meanings, as many of the activities are suitable for families and friends to enjoy together, with others perfect for making new friends, as the waters are home to migrating whales, dolphins and hundreds of species of fish. 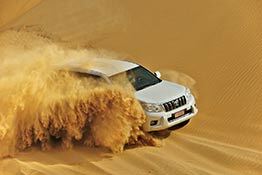 Al Sharquiya Sands and the Empty Quarter are both large areas of Oman covered in sand, perfect for those seeking the next adventure. 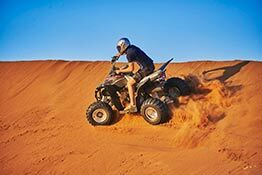 Activities in the desert include sand-surfing, quad biking and dune bashing (pictured above), with the astonishingly steep dunes providing the ideal playground for thrill seekers. Overnight camping is also an option, with guests able to enjoy the peaceful scenery of the desert, as well as stargazing and relaxing around a fire.